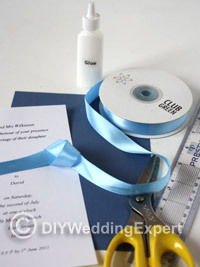 This simple DIY ribbon wedding invitation is a classic design that you can easily recreate for your wedding. Just choose ribbon and card in your wedding color scheme to make it personal for your wedding and follow the easy step by step instructions below. The size of your invitation is up to you, I would suggest deciding on your envelopes and then make your invitation to fit them. 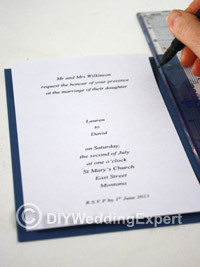 A print out of your wedding wording cut to size. Two different colored cards in your wedding color theme. 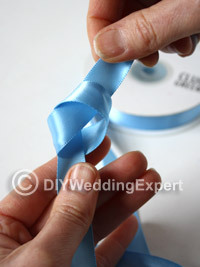 Coordinating satin ribbon (I used 1.5cm wide ribbon). 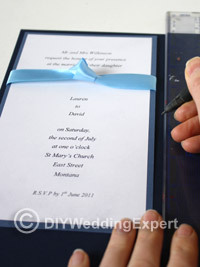 Place your wedding wording onto one of your coloured cards, draw an even border all the way around the wording sheet and cut out the card. 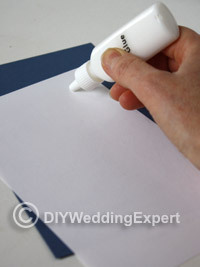 Turn over your wording and glue the back. When you stick it to the colored card make sure you get an even border all the way around. Take the end of your ribbon and tie a knot. 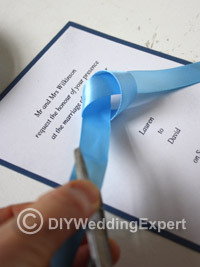 Measure your ribbon across the front of your invitation leaving a couple of centimetres excess on both sides. Place it in the correct position on the front. 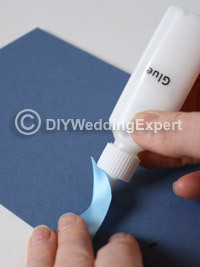 Turn the card over and glue the ends of the ribbon on the back of the card. Place this onto your final piece of colored card and measure an even border around the edges. Cut and glue in place. 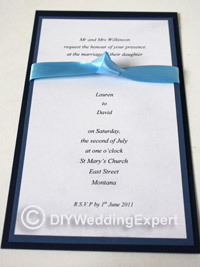 See our page on DIY buckle invitations for another one of our wedding invitation ideas.